There has never been a better time to design and build your dream backyard. Today there are more companies and individuals building outdoor kitchens and fireplace across the country than ever before. We at NOKFA caution you to do your homework and select a qualified design / builder so that your project will be a huge success. The number of manufacturers of outdoor kitchen accessories has also increased considerably and the options are endless. If you have the space to work with and the financial resources to make it happen, you are in for a treat. The lure of a stainless steel bar cooler filled with beers on ice, the ball game on the flat screen mounted on the wall, hanging out with friends and a big juicy steak cooking on the grill, for the average guy he would say (sign me up for that). That is actually the marketing behind some of the large manufacturers in the outdoor kitchen accessory business creating a vast array of options to fill your outdoor kitchen with just about anything you can dream up and a few you didn’t even know about. We will start with the bar cooler, also called the cocktail pro. This item is one of the most requested options for the outdoor kitchen. They come in a variety of sizes and optional equipment. The basic bar cooler will be about 15” wide with a counter depth of 22”. It will either have a flip open or removable stainless lid. Most units will have a single ice bin for beers on ice; make sure its deep enough to accommodate long neck bottled beers and be able to close the top lid. You want to be no less than 10” deep. Most units will also include a drain that can be connected to your plumbing or it is ok to simply let it drain out the base of the island, preferably to the back side of the structure. 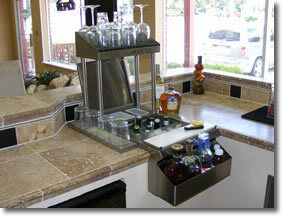 Your more expensive units will include a few more features such as bottle speed rails to accommodate your liquor bottle selection, bottle openers, towel racks, bottle well holders, separate ice compartments for clean ice for mixed drinks, glass tower racks and built-in sinks. Just like the options, the price will vary considerably ranging from $400.00 on the low side to as much as $2,500.00 for the top of the line model. Regardless of which model you choose, the bar cooler will, without a doubt, bring a lot of enjoyment to your backyard parties. The warming drawer is a functional accessory that most outdoor kitchen designers fail to mention during the design process. Most customers don’t even realize they need one until they have their first backyard party. I have managed 100’s of events and the warming drawer is a handy accessory item to have if your cooking for medium to large groups of people. The typical size is 27” to 30” and can easily be designed to fit in the lower section of the island structure to not get in the way of other more often used accessories. Most are 110v powered. Besides functioning as a food warmer, it can also double as a towel warmer although we don’t recommend using it for both simultaneously. 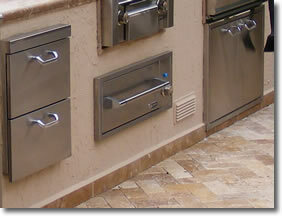 The average cost of an outdoor warming drawer is $1,250.00 to $1,800.00. 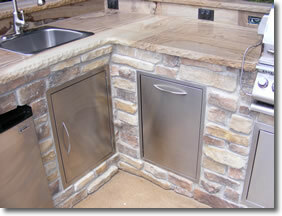 If you have the available space the warming drawer makes a nice option to compliment any outdoor kitchen design. The trash tilt is another popular option included in most all of my designs. The last thing you want is to build a beautiful outdoor kitchen and have an ugly trashcan in plain sight. Most trash tilts are about 18” wide and simply tilt out to accommodate a slide in plastic trashcan. They are also great to use as charcoal and pellet storage bins. A very modest priced option that borders on being a necessity for any well designed outdoor kitchen; your customer will surely appreciate the suggestion. The average cost of a trash tilt is $250.00 to $399.00.